The Calgary Underground Film Festival celebrates its 15th anniversary this month. Here are the stories behind some its most memorable moments, from Saturday morning all-you-can-eat-cereal cartoon parties to Q & A sessions with tires. 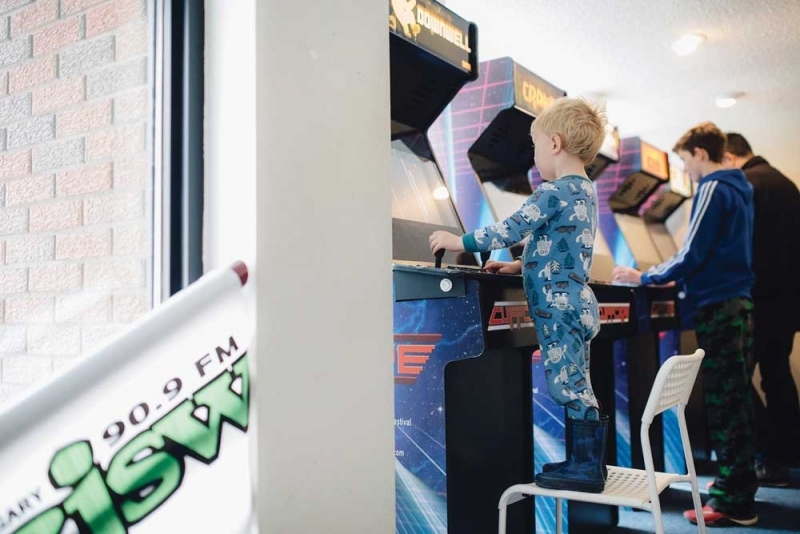 Custom arcade games at CUFF 2015. Photograph courtesy of CUFF. The Calgary Underground Film Festival (CUFF) celebrates its 15th anniversary this month. A lot of cool things have happened in that time, some of which you might have missed, so here are some highlights from the festival’s history, according to festival director and programmer Brenda Lieberman. In 2013, the festival screened A Band Called Death about a little-known punk band from Detroit that never “made it,” only to experience a resurgence in popularity decades later. CUFF secured not only the documentary but also a performance by the band afterwards at the Palomino. “The theatre had a standing ovation after the movie and the band was amazing” says Lieberman. The 2018 Calgary Underground Film Festival runs April 16 to 22. For information, visit calgaryundergroundfilm.org.